SAULT STE. 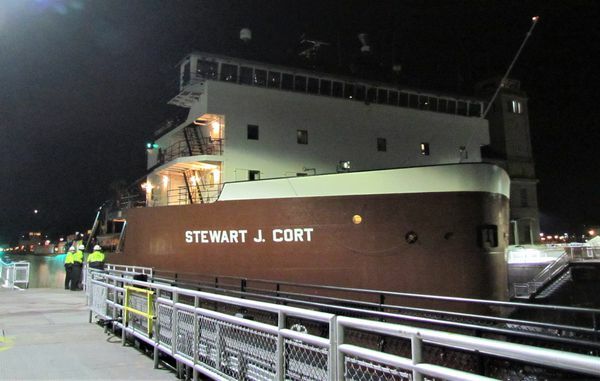 MARIE, MI – The Great Lakes 2019 navigation season officially kicked off at 12:01 a.m. today, with the first 1,000-footer to ply the inland seas snagging this year’s bragging rights as the first ship through the Soo Locks. The Soo Locks had been closed for its annual winter maintenance work since late January. More than 73 million gallons of water were drainedfrom the Poe and MacArthur locks – the only two of the four locks still in operation. Repairs were made, the bottoms of the locks were cleaned out, and then refilled last week. This video by DRE Designs – Great Lakes Marine Products shows the Cort’s arrival, and the fans’ reaction. For more coverage of Opening Day and in-depth coverage of Great Lakes freighters year-round, check out their Facebook page. The three big Coast Guard cutters working in Lake Superior – two from the U.S. and one from Canada – will soon be joined by other vessels, the military said. They will be working areas including Michigan’s Whitefish Bay and Duluth, Minn. before breaking ice in western Lake Superior ports like Silver Bay, Two Harbors and then Thunder Bay in Ontario, Canada.